thank you so much it is beautiful! thank you for all the hard work and exceptional customer service. 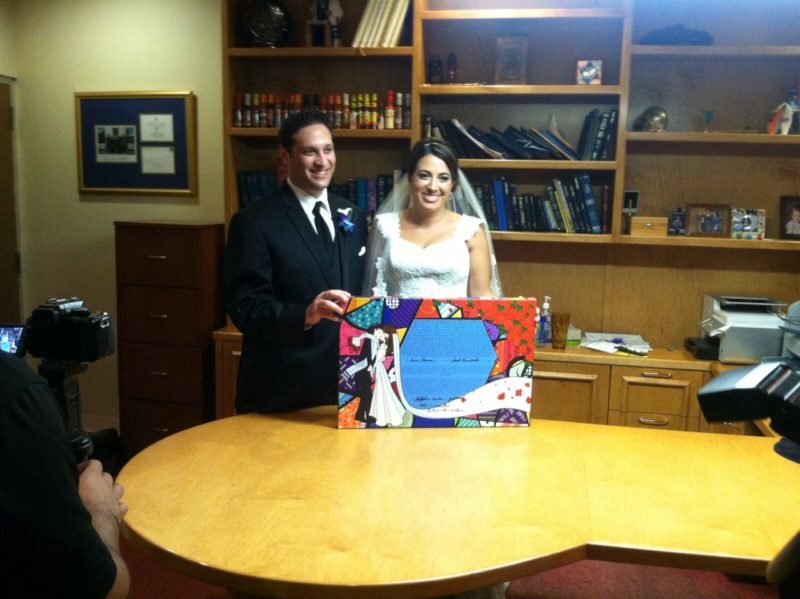 Erica & Matt, Ketubah Love from Fort Lauderdale, Florida, The Vibrant Hamsa Ketubahh. Thank you! Yes, they did receive it and it is beautiful! I am sure they will have it for many years to enjoy. Thank you so much for your excellent customer service.! We did open it and it’s amazing! We can’t thank you enough! Ketubah Love: “We Did Receive the Ketubah… and Love It! 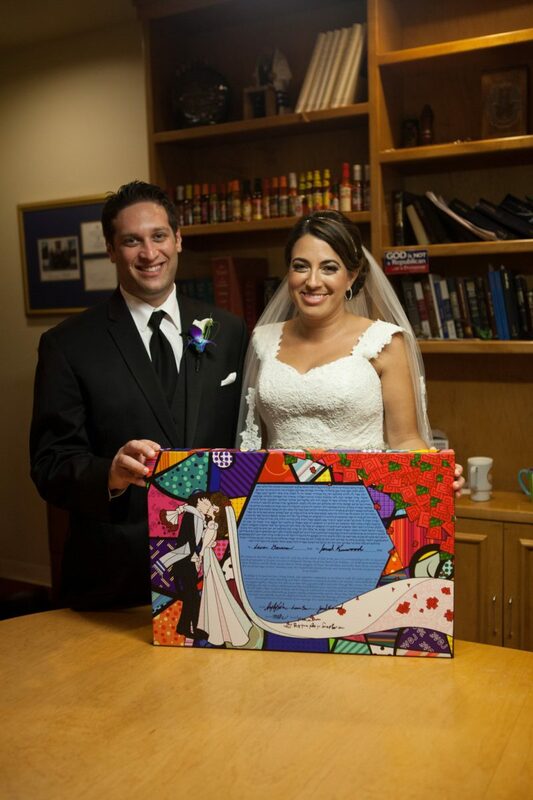 Thank you…we did receive the ketubah and love it! Thank you again. It has been great working with you. It’s absolutely beautiful & perfect! Thank you! We got the ketubah and we absolutely love it!!! It is perfect and just what we wanted! Thank you and your team so much, it was such a nice and easy going process and we will highly recommend you guys to our friends and family!!! We are thrilled! It’s lovely! Thank you so much again. Having been set up by a mutual friend, Jessica and Mark first met in Miami. “We just spent the weeks talking on the phone and getting to know each other. Before the fall session, he came back to Gainesville and we started hanging out more and more”. And as you can guess, the rest is history! Jessica spilled to us their love for adventure and exploring. The craziest thing they ever did as a couple? “We got our dog Blaze when we had no business caring for a puppy, but it was the best ridiculous thing we could have done. She is the light of our life and we love her so much”. With such an evident adventurous spirit to them both we couldn’t wait to hear about their proposal, and it definitely was one for the books! A typical weekend for Jessica of exploring the gorgeous Vizcaya retreat with Mark turned into an absolutely life changing event. Towards the end of our self-guided tour, Mark asked a tourist to snap our photo. It was very hot out, and in typical Mark fashion, he did not dress up, so certainly I would have never suspected that something was up. When the tourist had us pose for the shot, it seemed like Mark was going to pass out (from the extreme heat?). I turned to grab him in case he was falling, and saw that he was down on his knee holding a stunning diamond ring with a concomitant proposal for marriage. It was SOOOO romantic. At this point a good sized crowd was gathering, waiting for my response, as was Mark. Of course I said YES! Mark surprised me by whisking me away to the Mandarin Hotel. The room was decorated with flowers, candles, and goodies, compliments of his sisters who along with the rest of both of our families, were waiting and hoping for the fantastic news. I could not have asked for a better way to start the beginning of ‘happily ever after’ with my beloved. Jessica and Mark were married September 1st, 2013 and their wedding sounded absolutely wonderful. Without skipping a beat Jessica tells us, “I loved my whole wedding – not a single complaint. It was absolutely amazing”. As a way to tie in Mark’s profession as a dentist they personalized toothbrushes with their names and date of their wedding. They even included toothpaste and floss! They weren’t all teeth conscious however, “In addition, we put a mini white donut and mini black donut in a bag. We put the whole thing in a bag with a label that read “Eat, brush, and be married”. Their favorite part of the whole event? The first look and seeing each other for the first time, it was so special (also the part where we said “I do”)! Jessica and Mark finished up their whole wedding with a beautiful honeymoon in South Africa that not only included time spent in Cape Town, but also adventuring on a safari! AMAZING! From the Tinak Team to Jessica and Mark, it was truly a pleasure working with you both. Mazel Tov on your big day and we wish you a lifetime of happiness, adventure, and tons of love! …It is absolutely gorgeous! We love it! Thank you for all of your help!